With the critical semi final weekend starting tonight, we thought we’d take a quick look at the three key points defining each match-up. Melbourne easily have the highest contested possession differential in the league (+18 per game, GWS are 2nd with +10). Oliver, Viney, Brayshaw, Petracca, Jones, Harmes and Tyson all average more per game than any Hawks midfielder other than Mitchell and O’Meara. The side haven’t lost contested possessions all year. The problem? Contested possessions aren’t a mark of success. It’s Melbourne’s nature to disproportionately gather the “ground ball gets” which make up most contested possessions. Even in their heaviest losses – against Hawthorn in round 4 the Demons won 18 more contested possessions and they lost by 67 points. The issue with contested possessions is that a chain of them can be the result of sloppy or chaotic passages, and still end in an opposition clearance. Look instead to clearances to see if their midfield is working as they want it to. That’s a figure the Dees lost decisively in heavy defeats against Hawthorn and Collingwood midyear, but has been strong in for the year as a whole. 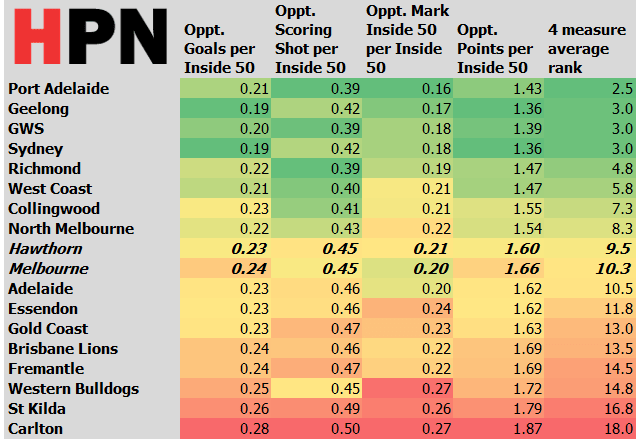 In our mid-season review, we found Melbourne and Hawthorn to be quite shaky defensively, ranking 12th and 14th on a 4-measure ranking of defensive quality. That’s now improved to seeing them 9th and 10th. On paper they look fairly close. That should mean forward line performance and inside 50 differential, both areas where Melbourne have been more efficient this year, will play a big role. The replacement of Ben Stratton by David Mirra may not prove a huge disadvantage to Hawthorn. Stratton has been their leading 1 v 1 defensive player, with 2.8 “contested defensive one on ones” a game and only a 23% loss rate, and he takes about 1.8 intercept marks a game. David Mirra’s 6 games this year saw him be virtually the same player in those respects – 2.7 per game and a 25% loss rate with 1.5 intercept marks per game. Stratton is a better defensive pressure act player (7.7 vs 4.7) but Mirra gets more rebound 50s (3.2 v 1.9). Tom Mitchell gets a lot of possessions and does really useful things with the ball – he’s a dominant clearance getter, wins heaps of contested ball, and delivers a good number of inside 50s. What he doesn’t seem to do is play much better in wins than losses. He gets about the same disposals either way, and does only a touch more useful things with them in wins. This is a small edge, but it suggests that while he’s a key part of the structure, Mitchell is more a fixed point in Hawthorn’s universe than a barometer. Putting abnormal attention into shutting him down probably isn’t a key path to success. Lewis has to our eye mostly played as a loose defender for a couple of months now, and we’d suggest he can probably handle placing a hard lockdown on Nobody just fine. So don’t worry about Lewis’ matchup, either. 1. Will Collingwood be able to penetrate the Giants’ defence? During the home and away season, the Giants only allowed 1.4 points per inside 50 – well below the league average of 1.6. However, there’s a strong reason to believe that the Giants backline has gotten even stronger on the run into the finals despite the loss of Heath Shaw, thanks to the return of Zac Williams and Adam Kennedy. Last week the Giants only allowed 10 scoring shots, and 30 points overall, to a Swans single key target forward line which is eerily similar in set up to the Pies unit, albeit less threatening overall. Both Williams and Kennedy give GWS them quick and accountable small defence options, and will keep their opposing numbers honest with their ability to create off half back. Add All Australian Lachie Whitfield into the mix, and the potent Collingwood small forward line might have their hands full. 2. Can the Giants match the Pies in the middle without Josh Kelly? On the other hand, few midfields are as damaging as the Pies. Their ratio of inside 50 to their opponents sat at 110% after the H&A season, ahead of GWS’s figure of 106.6%. The Collingwood midfield is deep, has a weapon in Grundy as an extra ball distributor, and generally gets plenty of forward entries. The Giants will need to at least limit how much it might lose the ball movement battle to have a good shot at winning, and may need to call on someone like Whitfield to move upfield in order to cover the loss of Kelly..
3. Will the Giants concede the ruck battle? The selection of Lachie Keeffe is somewhat puzzling from first glance, but the Giants may have a longer play in mind. The Pies defence has largely held opponents at bay this year, but it is more makeshift now than ever, with the season ending injuries to Scharenberg and Dunn, and the recent re-introduction of Goldsack. The Giants may see the best path to victory as conceding the tap battle to the far superior Grundy by having Keeffe take a large share of the ruck work, and use him as something like a tagger on the big ruckman. Keeffe’s speed and endurance has been noted in his short time at the Giants. With Lobb, Cameron and Himmelberg up forward, the Magpies may not have enough tall defenders to adequately cover all these targets. Previous Post:Otherwordly attacks, death lineups and suspect defences: the questions facing week one of the AFL finals.